Turkey Creek Lane · Free reference library helps two “buddy sour” horses. Beautiful photos of your horses 🙂 you know Im a pic fanatic! I checked out RedPony…..John Lyons was quoted so now Im hooked. I LOVE LOVE Lyons and his ideas. I once attended one of his seminars in Wichita KS at the Horse Expo, the guy is awesome! Thanks for your question on separation anxiety and for the great link. Very helpful replies! 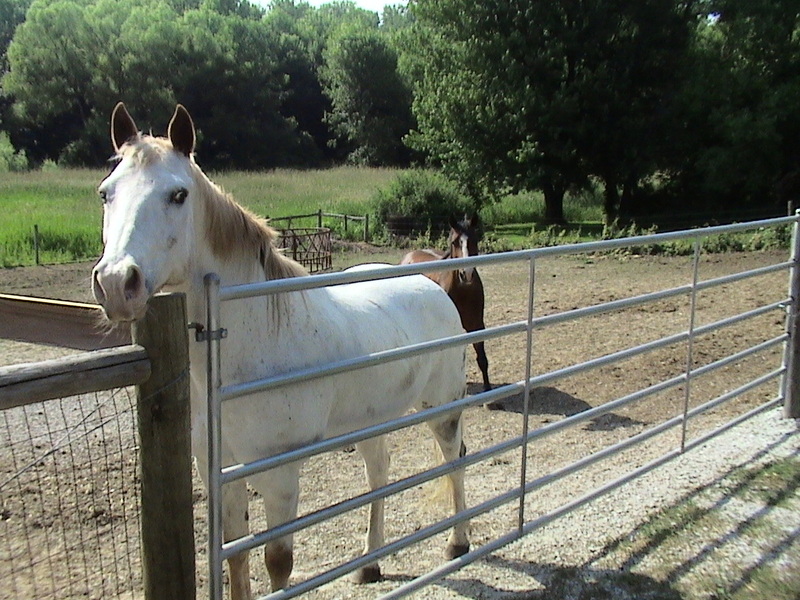 I took photographed a horse that was pale colored like this one. A very sociable horse. She had square pupils. It was one of the strangest things I have ever seen! My little herd also suffers sepration fits when on or more are taken out of pasture. I solved this by taking each one out and putting that horse in our round pen which was still within sight of the other horses but about 500 ft away from them. They learned quickly that when they did not pace, neigh to each other or even look toward each other with their ears pricked forward that only then would I put them back with the herd. Now I can take them out of sight of each other without much of a problem. The one being taken out does not react as much as the herd left in pasture. Only when all horses remain calm I know I have success. I do find that the mares react much more to seperation than do the geldings. The geldings don’t seem to worry about it at all. Skipper and Summer are beautiful! I miss having horses some days. We took several horses in on rescue. Separation anxiety was the most difficult social problem we had to deal with. We had horses here for seven years. We rode with friends. For various reasons, they put their horses out on a free lease for two years. Our horses became too old or scarred (from physical abuse) to carry a rider comfortably so our riding days ended. The horses didn’t see each other for two years. We had one horse put down and two died of very old age. Not long after, the friend had her horses returned, rode up by the farm on one of them, and the horse went a little nuts. He whinnied and neighed, stomped and snorted, tried to leave the road to go to the pasture gate, and was frantic when we couldn’t find Gia, Cola and Andy. Horses are such social creatures. I felt badly for him. He truly missed his friends.